It’s a new year, so you need a new plan, right? Here’s some quick new year’s resolutions that may help you get you ready to accomplish some AMAZING content marketing in 2019. Make a Plan. Develop a content strategy for the year – and STICK TO IT. If a year feels overwhelming, I personally prefer to develop a loose calendar for the year, and then a detailed plan one quarter at a time. Note that the strategy should be set at least 4-8 weeks in advance. Do Better Than Last Year. Set a stretch goal, but one that feels achievable. Whether it’s improving open rates for email marketing, increasing ‘likes’ or ‘shares’ on social, or growing your email marketing contact lists – pick one area you really want to focus on this year and set your strategy around improving those metrics. Don’t Stray from the Strategy. Ensure EVERY. SINGLE. PIECE of content published aligns to a clear goal – and has a defined, measurable call to action. Try Something New. Branch out from what your followers expect from you with at least one new content format in 2019 – surely there at least a few you haven’t tried. Whether it’s a strategic video, a fun quiz, competition or contest; an expert white paper or webinar, do something new! 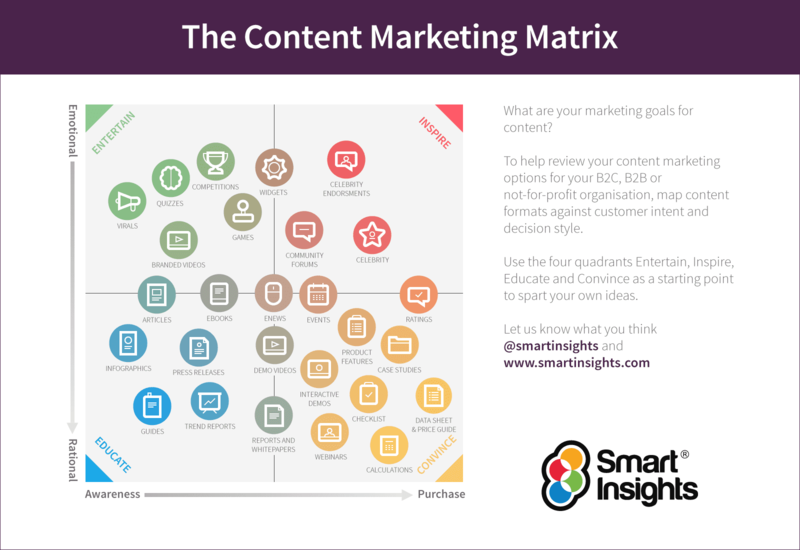 For inspiration, I love this infographic (courtesy of SmartInsights). Do More of What Works. Often, as digital marketers, we deploy a strategy and quickly move onto the next item on our list. Be sure to go back and look at your metrics over time to determine which strategies are delivering for your brand. Do MORE of what has worked well for you and LESS of what doesn’t – it’s that simple. Good luck in 2019! What are your content marketing New Year’s resolutions? I’d love to hear from you – maybe you’ll inspire me or someone else. Oak City Communications is based in Raleigh, NC and provides comprehensive, freelance content marketing services. Need help? Drop us a line.